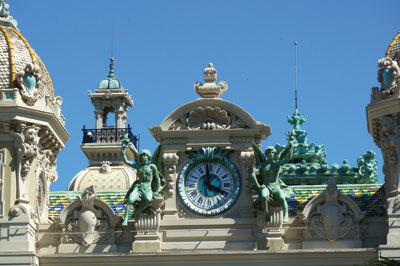 The lavish Monte Carlo Casino was originally built in 1863 to the plans of French architect Gobineau de la Bretonnerie, but it was the further work of Charles Garnier and Jules Dutrou that transformed and endowed it with the ornate Beaux Arts style for which it is now known. It's hard to believe, but the casino was built as a remedy to the House of Grimaldi's financial problems. With Monaco's luxurious contemporary reputation as the playground of the world's multi-millionaires, it is safe to say that the gamble paid off. In fact, it is now the main source of the principality's income, and the reason why its residents can live tax-free. The rich, excessive glamour of the building and its clientele made it the inspiration for the 'Royal-Les-Eaux' in Ian Fleming's Casino Royale, as well as the filming location for scenes in several James Bond films. This shot is of the top centre part of the deliriously decorated facade above the main entrance, which is decorated with beautiful, swirling ironwork, with neoclassical references in the columns and sculptures. This lateral facade was uniformed in 1906 by architect Arthur Demurle. A short, elegant balustrade runs along the top, interrupted by green bronze sprites carrying torches and figures representing the four seasons. A building which screams extravagance.